Here are the Scifi Fantasy coins I ordered, We need a better way to store them! Quick project to share with you all today. 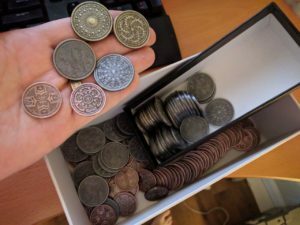 My friend turned me on to Fantasy Coin Inc. Fantasy Coin Inc makes legit metal coins that you can use as a stand in for those crumby cardboard “coins” that come with your board games. Nothing quite beats the visceral metal “clink” and pushing piles of these puppies around so I HAD to get some. I decided to get a set of the Sci-Fi Style coins, and a set of the Dwarf coins. These things are absolutely stunning and a real pleasure to handle. For each set I ordered a large amount of bronze coins, a smaller amount of silver coins. and an even smaller amount of gold coins. These can be used to designate different amounts in the game, such as 1, 5 and 10 “units”. There’s only one problem however… how to store all these beautiful coins in such a way that’s easy and portable? I decided what the hell, I have a 3D printer so I should just go ahead and use it! I stacked up the coins into piles that made the most sense.. 2 bronze, 2 silver, and one gold. 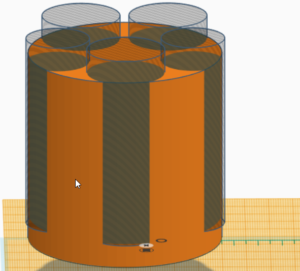 Then after taking all the measurements I used Tinkercad to design the holder. Once designed it was just a simple export to STL and pulled it into Cura to print! For the first print I scaled the Z-axis to just about nothing so that I could get a quick, flat print to test out the coin sizes. Nothing feels as good as designing and printing something the first time through and having everything fit up perfectly! 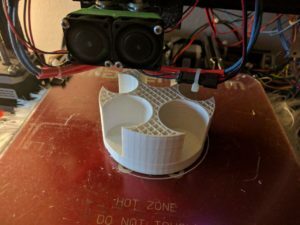 I then drove this project home by printing the coin holder at full scale, and printing my favorite screw top container from Thingaverse to hold the whole thing for easy storage. 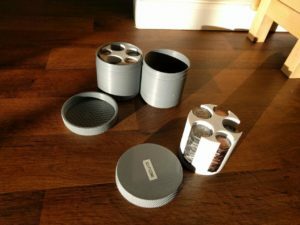 Seriously I use these screw top containers for pretty much everything, they are great! 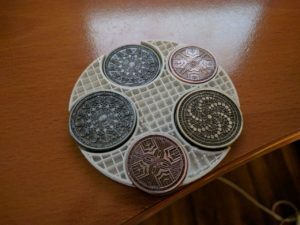 If you have similar fantasy coins and could make use of my holder, feel free to grab it from Thingiverse here: Fantasy Sci-Fi Coin Holder. Happy Gaming! Posted in 3D Printing, General Making. Tagged 3D Modeling, 3D Printing, boardgames.